Implants need enough bone to help hold them in place. Some people don’t have a healthy foundation of bone that can support them. That problem can be overcome with bone grafting prior to the implant surgery. What Are Bone Grafts for Dental Implants? Bone graft is FDA-approved material placed into a tooth socket or over weak areas of bone in a brief surgical procedure. The graft material may come from a bone in your own body (autograft), dried animal bone (xenograft), or another person’s bone (allograft). Grafting often needs to be done a few months before getting an implant to ensure the site is stable. 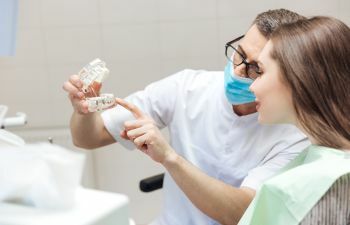 The best way to find out whether or not you have enough bone for a dental implant? See a dental implant specialist in Torrance. At Torrance Oral Surgery Center, we offer the latest in CT scanning and other digital imaging to measure your bone levels. If you require bone grafting, we’ll let you know and help you decide on the best treatment option.